Hi! 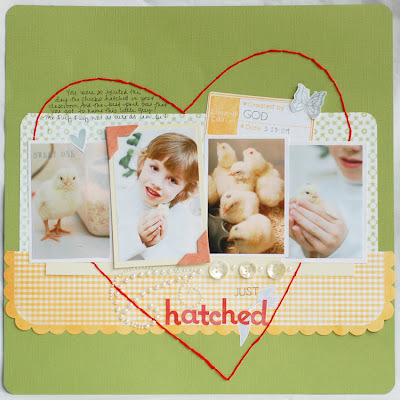 Last week's blog hop was a big success! Thanks to all of you who played along and left comments. 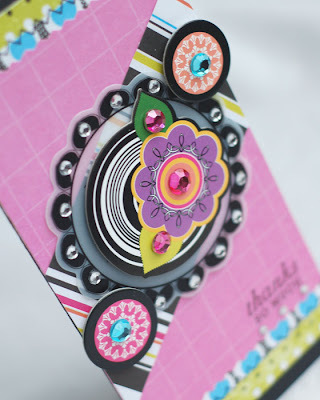 Be sure to check the Moxie Fab World Blog and Paper Crafts Connection today, Tuesday the 28th to see if you're one of our winners. Speaking of prizes, here's another fun challenge for you. Webster's Pages is sponsoring a 'Show Us Your Backside' contest. 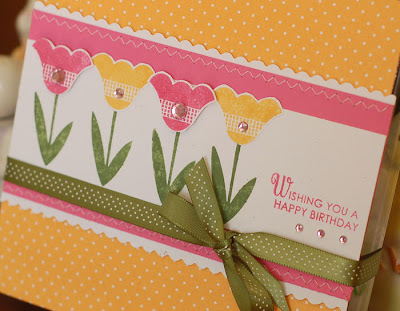 They want to see how people use the flipside of their fun, flowery papers. The patterns on the back are gorgeous- lots of stripes, small patterns and dainty designs. 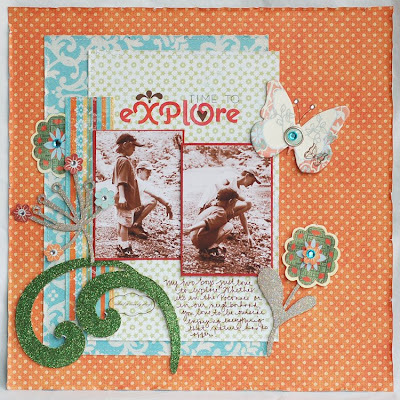 Click HERE to see details about the challenge as well as to see what some guest 'graphic' style designers did with the papers. 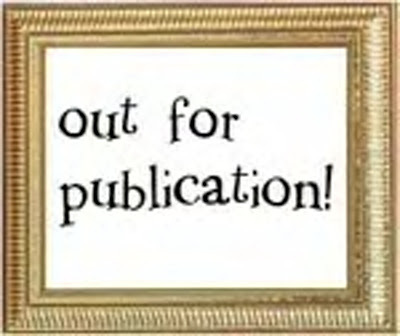 The first place winner will have a chance to be a guest designer in September which means they will receive Webster's Pages' new summer 2009 CHA releases to work with!! This layout was my contribution. I'm certainly not a graphic designer, but I created something that didn't have lots of hand cutting and tons of layering. Speaking of Webster's today is the day they are hosting two live chats. One at 9am and one at 9pm. During this time, there will be a FULL preview of Webster's new line Sweet as Cherry Pie. This peek will only be available during the chats until the formal release of the line on May 1st. So if you miss this morning's chat, stop by tonight! It's based on a super cute sketch by Jessica Witty. 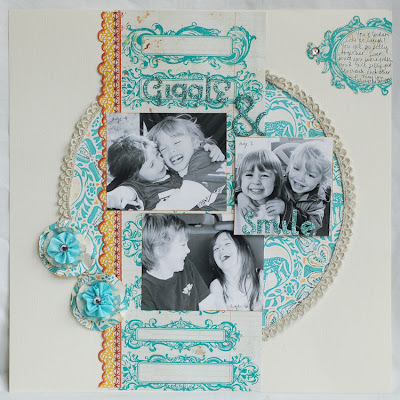 Stop by the Emma's blog and see what the rest of the team did with the sketch! 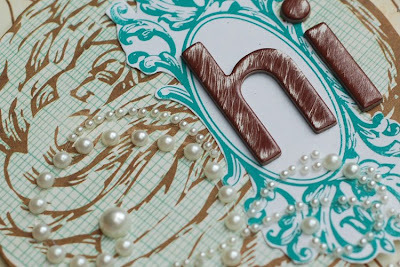 Finally, today I posted a page on the MMM blog. You can see the whole thing HERE. Are you ready for one rockin' good time? Well, you've come to the right place. 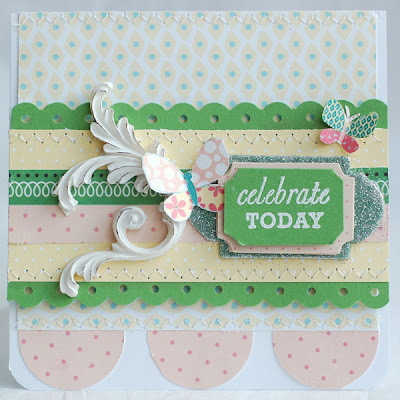 As you may know, Paper Crafts is celebrating the release of the 225 Cards and Projects issue. My cover project for the issue was made with a strawberry container. 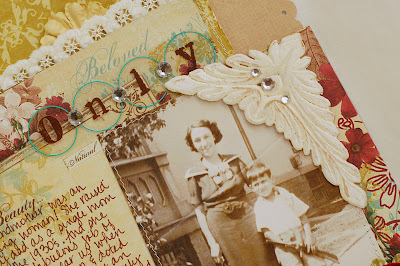 Today, I have another repurposed project for you. Not too long ago I received my first set of Papertrey Ink stamps. Aside from loving the stamps, I loved the boxes they came in. I knew I couldn't throw them out. So, I've been decorating them and using them as gift boxes. 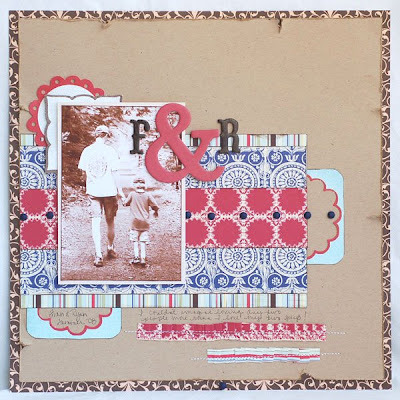 This one uses PTI cardstock, bitty dot paper, ribbon, stamps and ink. And here's something even better... you have 11 more chances to do so. Just visit these other ladies to view their fun projects and leave a comment for another chance to win. 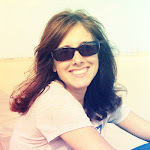 So, happy blog hopping. 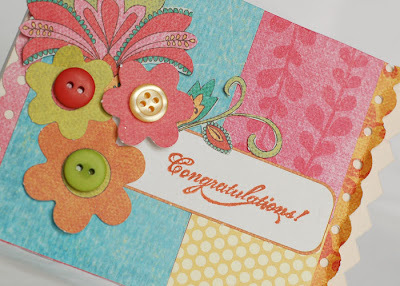 Be sure to check the Moxie Fab World Blog and Paper Crafts Connection on Tuesday the 28th to see if you're one of our winners. 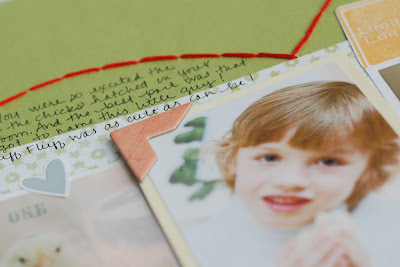 Lots of Making Memories on here along with some Papertrey Ink and Melissa Frances. 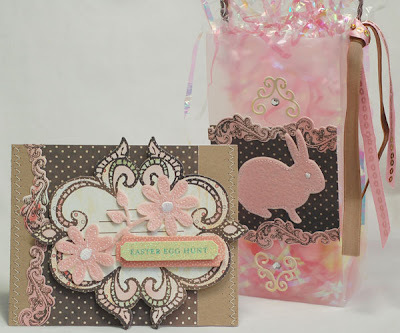 To see the sketch and the other amazing cards, visit Valerie's site HERE. 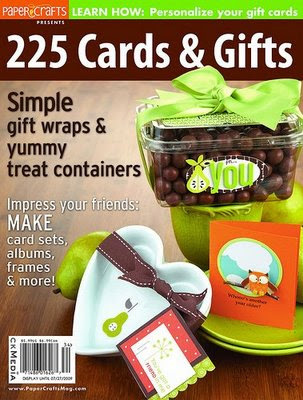 The next thing is that Paper Crafts is releasing their next awesome issue, 225 Cards and Gifts. Do you see that cute little gift box at the top. It was made by your's truly!! 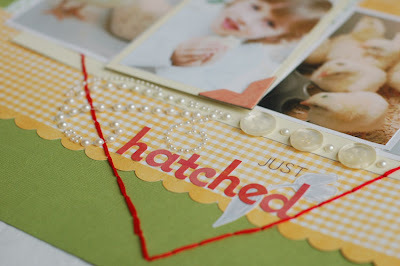 Well if you head on over to the Moxie Fab blog you'll be able to read some gift making tips and tricks from several of the girls who's work is in the issue. 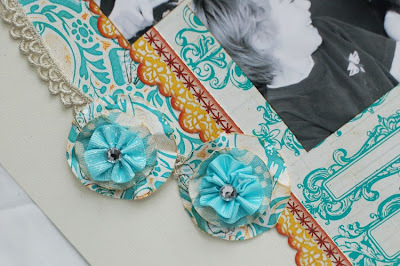 Plus, if you leave a comment there, you could win one of the featured projects! So head over and join in on the fun. These girls are also participating. 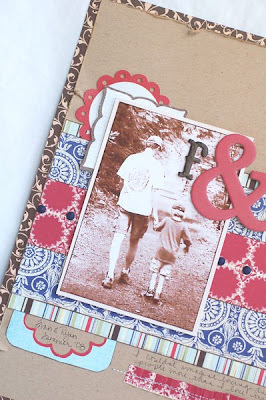 Be sure to check out the Paper Crafts blog, too Kim is sharing a fun food gift project and will be doing a great American Crafts giveaway. And don't forget to stop back on Friday. 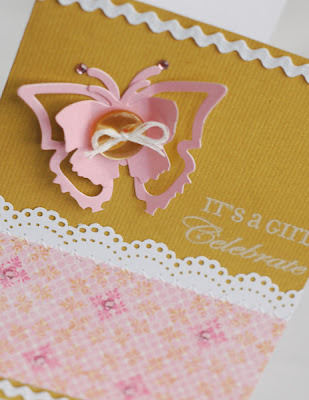 I'll be a part of another fun event that will be celebrating the release of 225 Cards and Gifts. It's going to involve some awesome prizes!!! What a gorgeous weekend we had. It was perfect...mid 70s, no humidity and lots of sunshine. We played outside for hours! I even started some weeding, ugh. But, it wasn't so bad given how nice it was. Today? Not so much. We're back to rain and it's only about 49. Oh well. I guess that's spring for ya'. 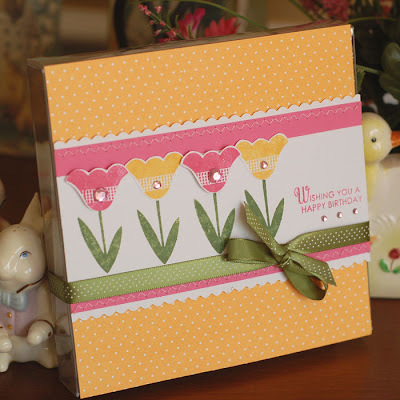 Today I have the rest of my Label Tulip projects to share with you. I saved my favorites for last. This first page is of Ryan and my friend's DD. They've know each other since birth. They truly crack each other up. I created the background paper using Hambly rubons. The paper is Sassafrass and the trim is Prima. I painted the chipboard and stickers and added the glitter. 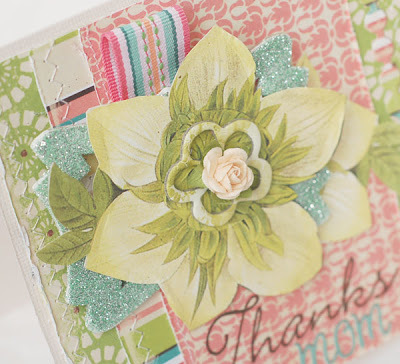 This card was made with the stamp that came in the add on kit. LOVE it. I already have a bunch of other ideas for how I want to use it. And then there's this one. Are these the cutest pictures EVER or what??? Ryan's class hatched chicks, so we had to go and take pictures one day after school. 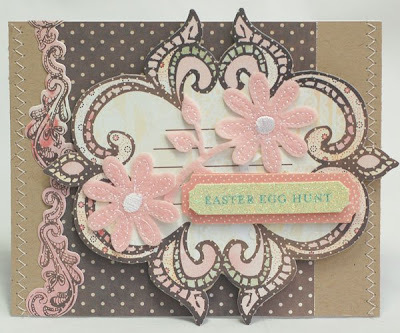 I used some Pink Paislee and Lilly Bee papers on here. The rubons are all PP and I hand stitched the heart. This next card is based on this week's CPS sketch. Too fun! I felt like doing some nice bright colors. 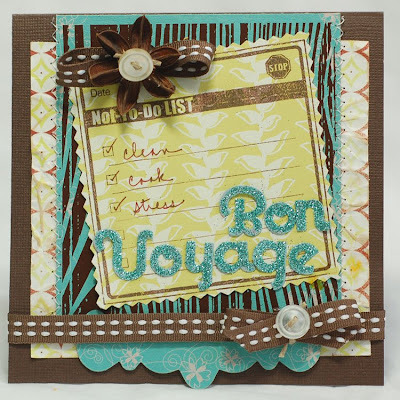 I used Me and My Big Ideas papers and stickers on here along with a Maya Road sheer and Papertrey stamp. That's it for now. Be sure to stop by later in the week for a fun giveaway! I had so much fun making my projects this month! The April kit is to die for!! Check it out HERE. 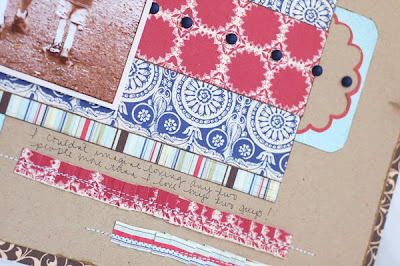 Cathy puts together just the right mix of papers and goodies. This first project uses a picture of Ryan that I've had for a while. I've been seeing this face more and more lately. Ugh. Just had to create a page about it. This next one was our Member Lift for the month. I lifted the talented Anna Sigga. You can see her layout along with what the team did HERE. I peeled off the back of the chipboard and added glitter to it. It holds the glitter wonderfully. I'll leave you with this last card. 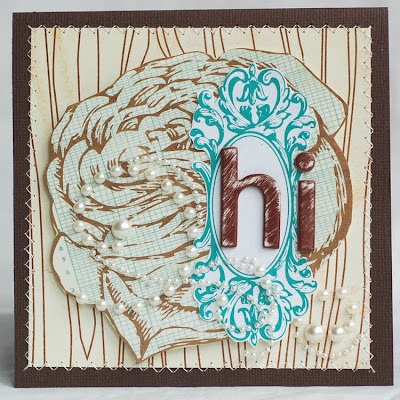 I used PP paper and chipboard, a Hambly rubon and Prima pearl swirl. Thanks so much for stopping by! I'm heading outside to plant some herbs! 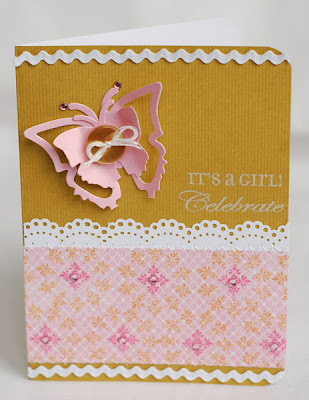 I love creating anything that is girly and pink. Today's projects are right up my alley. Firt is my Emma's project for the week. I used the absolutely yummy Webster's Magical Wishes line. I'm just in love with it. 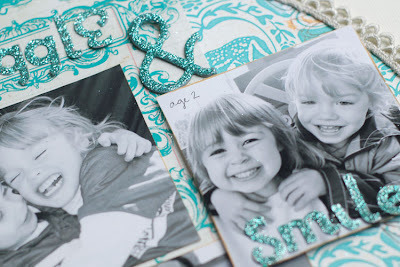 I also used Maya Road chipboard frames that I covered with some glitter. The matching mini-hanging can fit inside of the card. 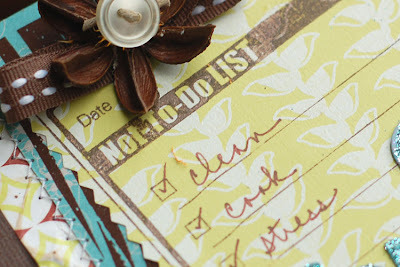 You can add a magnet strip to the back and place it on the fridge or find a little spot to hang it elsewhere. This next card is based on Kazan's sketch this week. It's such a versatile sketch! 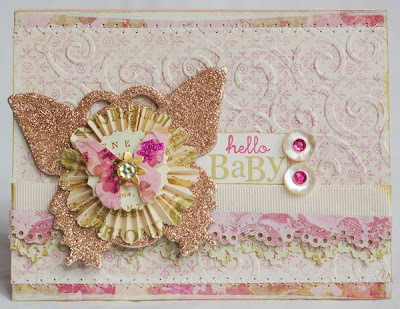 I used lots of K and Company papers and flower, some punches, a Cuttlebug embossing folder and a Tattered Angels butterfly covered in glitter. The sentiment is from the Papertrey Ink Mixed Messages set. I think I use it on everything now. Happy Easter to all of you. I love this day! It's such a celebration of new life, hope, and all that is good. May you spend it with those you love. We will be heading to church today. It's my favorite day of the year there. After being bare for all of Lent, it is a profusion of daffodils, lillys and other spring flowers. Sorry I have been such a bad blogger this week. Ryan and I have both been sick, though we're on the mend now. It was his birthday on Thursday so between his school party, his 'real' party and getting ready to have 15 people for dinner today, I've been running around like a mad woman. In between all of that, I've been working on my Label Tulip projects. 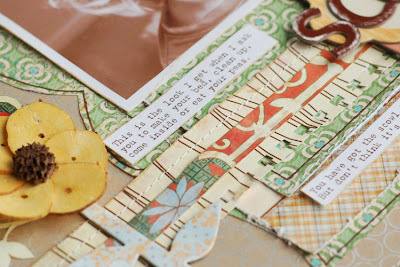 Let me tell you, I love this month's kit! The reveal will be on Wednesday night. The kits will be ready for sale and all of the projects will be revealed. In the meantime, here is a sneak peek of what I've been working on this past week! Finally, I'll leave you with these two cards. I made them a while ago, and have probably already shared them, but I thought they'd be perfect for today! 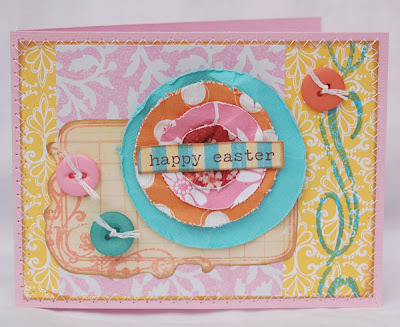 Have a wonderful day and a blessed Easter! Thanks so much for stopping by! Hi! Thanks so much for all of the kind birthday wishes! I had such a nice day. Now, it's on to getting ready for Ryan's birthday. It's on Thursday. Of course, his day WAAAY overshadows mine. We have the school party, the 'real' party and then family over on Easter and are doing the 'family' party. This week is going to be a bit crazy!! Well, here is my card for this week's Raspberry Challenge. Dawn sucked me in as soon as I saw it involved Red and Kraft!! I used this week's CPS sketch for the card, too. I pulled out my new "Life" stamp set. And some Bitty Dot paper in Poppy. All of the cardstock is PTI. I even pulled out my Nestabilities, that have been sitting in a drawer for quite some time, for this one. I love how it turned out! 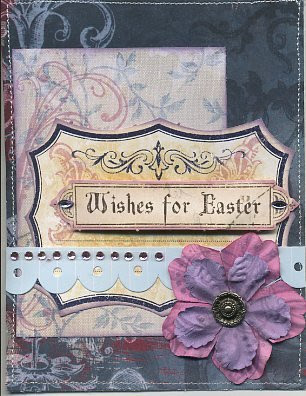 This next card is one that I did for my friend and fellow Master, Melissa Blair. She gave birth to a beautiful baby girl last week. 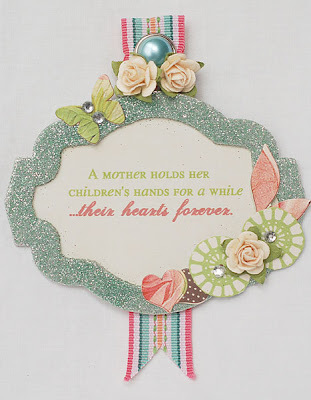 We all created cards for her and are posting them on the MMM blog this week. 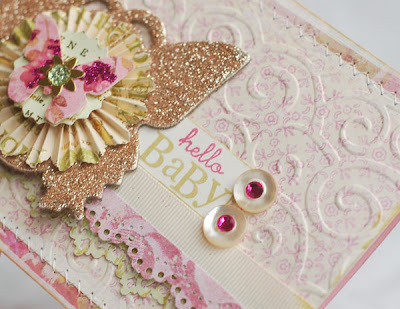 Stop by if you need an idea for a baby card. There's lots of inspiration there! I used PTI stamps on this one, too. 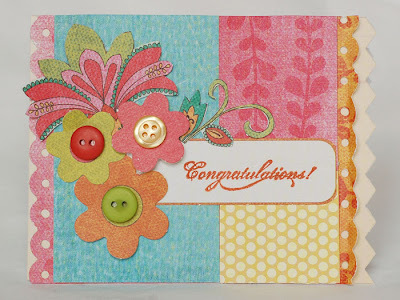 I created the pattern on the bottom paper using the Simply Stationery set. Four is my favorite number, so I guess today is my lucky day! 44 years ago today, I entered the world. ;) I woke up to some white tulips, my favorite flowers, and some great gifts - a Paper Trey gift certificate, a Sephora gift certificate and Breaking Dawn on CD. My wonderful hubby did a great job! Of course, the links I emailed him certainly helped with his shopping. Hee hee. Seriously, he never knows what to get me, so my 'hints' are always appreciated!! The Hambly paper is a really pretty shade of lime. For some reason it doesn't look quite right in the picture. 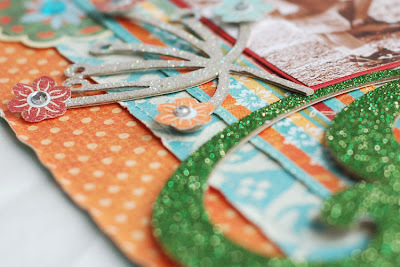 I also used some fun SEI glittered cardstock. This card uses the same products. It's based on this week's 2 Sketches 4 You. I almost didn't get it done on time, but I did!!! I turned the sketch and substituted flowers for the circles in the cluster. Also used my new EK Success punch. LOVE it! Well, that's all for today. Off to celebrate my day with the people I love most. And tonight? We're watching the Final Four. Go Wildcats!!! Well, it's rainy today. But, you know what that means? April showers bring....FLOWERS! More specifically? Tulips! Yes, the word is out out. I was asked to join the Label Tulip team. I'm so excited! I've been a longtime lurker in their gallery and I LOVE the kits. So, it will be great getting to play with them each month. I've got April's kit already and it's awesome! Look for some sneak peeks soon. Just a quick one to share today. This is my project for Emma's this week. Our challenge was to use the frosted bags for something. 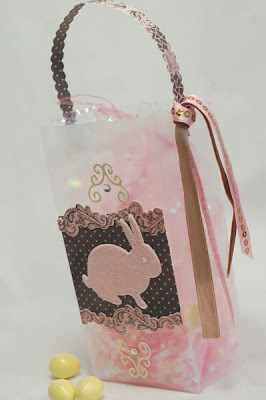 I made a little Easter Basket set. I mostly used BG Porcelain on here. The felt pieces are Martha Stewart. 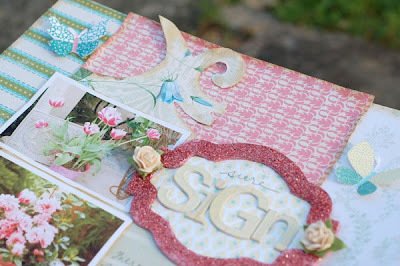 Definitly check out the Emma's Blog for some SUPER cute projects! !